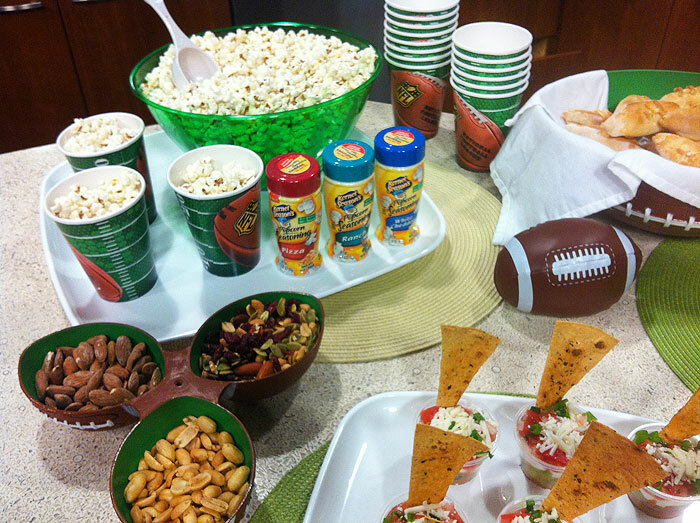 Do you know that a Super Bowl Party is the second biggest eating day of the year, right behind Thanksgiving? But unlike Thanksgiving, Super Bowl parties focus on a menu filled with heart-stopping junkfood and an endless supply of alcohol. It’s no wonder that most people consume their entire day’s caloric intake in just one Superbowl meal. But as with all parties, your guests expect to be indulged, not put on a diet. And since for some guests, the food may be even more important than the game itself, it’s important not to bring out the tofu sliders and kale chips, and instead, make some quick alterations to the indulgent treats your guests have come to love. 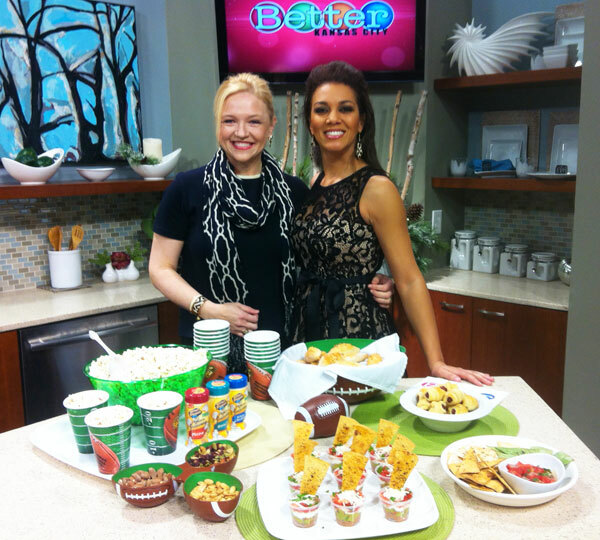 I had a chance to show off some healthy Super Bowl party ideas to the folks at Better Kansas City and the best part was… these ideas can be incorporated into appetizer menus for ANY party! Below is a photo of myself with one of the wonderful hosts of Better Kansas City, Kelly Jones. Don’t let her glamorous looks fool you, Kelly is a SERIOUS football fan! 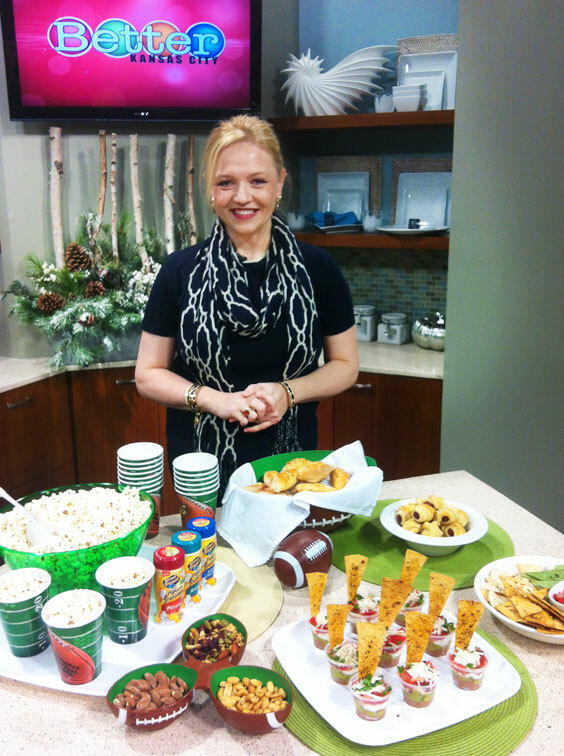 So, without further delay, here are my top healthy Super Bowl ideas you can easily “sneak” into your party menu! As many of you know, pop corn is an amazing snack. It’s fat free, gluten free, and packed with fiber… which you’ll probably need after a night of junk food feasting. Create a “station” where people can fill a cup of popcorn and offer a variety of popcorn seasoning. The seasoning can be purchased at most super markets and comes in a variety of flavors, such as ranch, pizza, and white cheddar. Or, offer various flavored salts and herbs. For an added treat, incorporate different nuts into the popcorn bar/station which can be added to their pop-corn mixture. Even a nutty trail mix filled with dried cherries, cranberries, and roasted seeds will be guaranteed to score a touch-down with your guests! These are Russian meat filled pies. Now, you can fill them with anything… lean meats, broccoli and cheese, pizza and cheese, and even sweets. They are made with regular store-bought biscuit dough and filled with whatever you choose. And they also happen to look just like footballs. 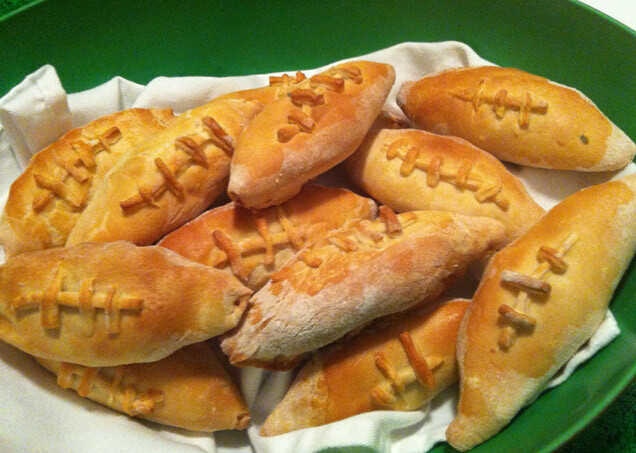 And if you think you need to make them even more authentic, add a seam to the top and the pirozhki will look EXACTLY like a football! A great alternative to sliders or even… dare I say… oily pizza. FOR THE FULL RECIPE, CLICK HERE. The king of all high calorie dips, the seven layer dip is the ultimate power junk food! It combines multiple layers of unhealthy ingredients into one artery-clogging dip! But my alternative not only shaves a number of calories but also looks great when sitting on your buffet. 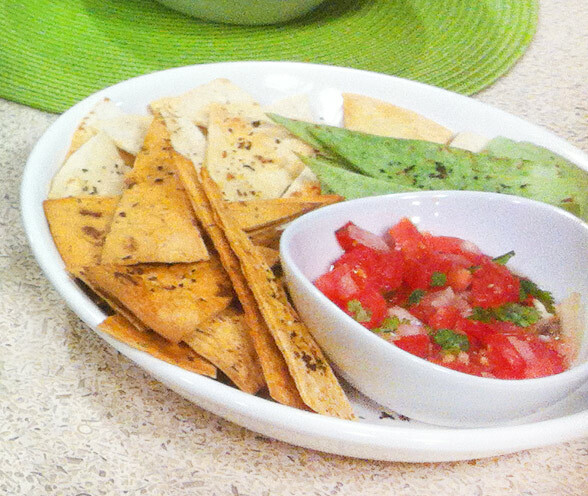 The number one tip… start with fresh ingredients, such as home-made salsa and guacamole. Then, instead of real sour cream, use Greek plain yogurt. It has a similar taste to sour cream — I promise no one will be able to tell! Last but not least, serve the dip in individual cups. The presentation is beautiful and you won’t see your guests doing the ultimate “no-no”… double dipping! And, if you want to receive RAVES all evening, calculate the calorie content of your seven-layer dip in each individual cup. If your guests know that each cup contains, for example, 50 calories, they’ll be able to keep track of their calorie intake, which is a huge help for your health and calorie-conscious party goers. Add baked chips (more info below) and you’ve got a winning combination! 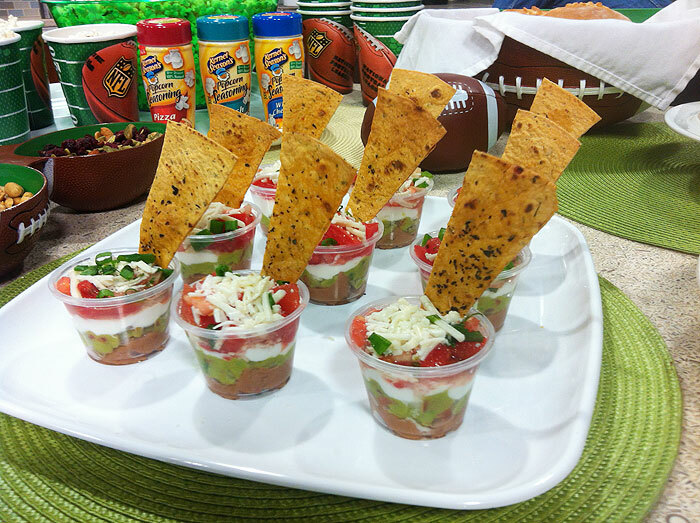 Chips and dip are staples of any good party, and super bowl parties are no exception. But instead of surrendering to the fats and calories, make a healthier alternative that everyone will love! Simply purchase flour tortillas at the store and cut them up, brush them with a little olive oil, and sprinkle with salt and your favorite herbs. Bake at 375 degrees for about 10 minutes (keep an eye on them or they’ll burn). You’ll have a “gourmet” looking baked chip that is a healthier and even better tasting alternative to the store-bought ones. Less sodium, less trans fat, and a TON of flavor! Last, but certainly not least (in calories or fat) is the ultimate “heart stopping” junk food… Pigs In A Blanket. With enough sodium and trans fat to leave you in an ER, making this snack healthier is not only easy but a necessity!! When purchasing the sausages, choose the turkey sausages, which are a reduced fat version compared to the usual pork that cuts close to 75% of the fat… yes, 75%! Hillshire Farms makes delicious turkey mini-sausages. The reduction in calories is also significant. For an added benefit, use reduced fat croissants to help this snack be a true winner! Just applying these two easy alterations can significantly reduce the impact on your guests’ waistline!